I have to admit, I bought this book entirely because of its title. I was looking for Christmas gifts for my brother, and he’s a beard guy. To be clear, he’s not sporting one of those handsome, carefully maintained beards, but rather, a look that shouts “I just wandered out of the deep backwoods.” (I’m positive I’ve seen small twigs and feathers stuck in it before.) 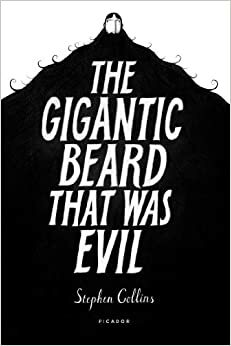 We’re part Norwegian too, so although his hair is dark blonde, his beard is as red and thick and gnarly as a viking, and when I saw the illustration on the cover of Collins’ graphic novel, I knew I had to buy it. The title (and the first few pages I’d read when I purchased it) had led me to believe it would be a comedy, but in fact, I found the story painful and beautiful and sad. Collins is not only a gifted artist but an insightful storyteller, and I was completely captivated from start to finish. I also found myself constantly wondering about the direction he was taking the story. For me, it is a rare treasure to find a book with a relatively simple concept so deftly told that I couldn’t deduce the ending from the halfway point. By the time I arrived at the end, I only wished to read more, to have a sequel to pick up that might unravel the story that clearly exists after the final page. It’s not that he needs one, but Collins has clearly imagined a whole world for his put-upon protagonist that the reader will never see, but I, for one, am desperate to know more about. For more about Stephen Collins, head over to his beautiful website. The art that went with it was amazing too – absolutely unresistable! This was such a surprise. It was bought for me as a gift, and I had to say I was a little wary, but within a few pages I was hooked. The artwork was just lovely and the story was excellent. I also found myself wondering where the story was going, as it takes a definite turn at one point. It’s a fascinating allegory for human nature. I also recommend Tom Gauld – Goliath, another sad story which takes you somewhere you never expected to go. Thanks for the recommendation! I’ll definitely put it on my list!